With a history that stretches back over more than 200 years, the Jameson Distillery Bow St. is one of the oldest distilleries in the world. 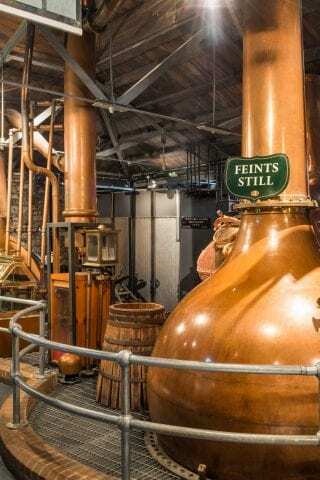 With the opportunity to watch live whiskey maturation and learn about one of Ireland’s most thriving industries, a visit to the Jameson Distillery is a must for people of all ages. If the Jameson Distillery is high on your to-do list while you’re staying in Dublin, consider booking a room at the Maldron Hotel. It’s located just 80 metres away, or a one-minute walk from door-to-door. You can purchase tickets at reception, just ask a member of our team. Alternatively, you can purchase your tickets when you arrive at Jameson Distillery. Additionally, the Maldron Hotel is perfectly situated for other Smithfield Square activities. In 1780, James Jameson began his distillery adventure with the aim of making the world’s best whiskey. Today, his Bow Street distillery still stands strong, manufacturing bottles for whiskey enthusiasts around the globe. As the building and the business within it form a strong part of Dublin’s industrial history, visitors and locals alike can see what happens inside. There’s an interactive museum aspect, as well as the chance to blend cocktails, making it an interesting experience for the entire family. If you want to bring the kids along, or those who don’t drink, try the Bow Street Tour. It lasts for 40 minutes and gives you the chance to experience the heritage and history of Jameson’s Irish Whiskey. In addition to learning about the drink, you’ll gain a good grounding in other elements of Irish history. Alternatively, why not book a whiskey cocktail making class? Whether you’re a fan of Irish whiskey or not, this is an excellent opportunity to get creative in the pursuit of serving a delectable drink. Hosted by a skilled Jameson bartender, you’ll learn how to make three exciting cocktails. Or, if you really want to impress your friends on the return home, try the Jameson whiskey blending masterclass. You’ll start your adventure by tasting premium whiskeys before creating your own blend to take home. Of course, you don’t need to book a Jameson Distillery tour to enjoy the distillery itself. The bar is open to non-ticket holders so consider heading in there and trying one of the many drinks they serve. The Guinness Storehouse, which also offers exciting tours and a rooftop bar. Trinity College, which is a short walk from Smithfield Square and home to one of the world’s oldest libraries. Phoenix Park, which you can reach on foot within a few minutes and immerse yourself in nature. Whether you want to visit the distillery or explore everything else Smithfield Square has to offer, the Maldron Hotel is a convenient place to stay.